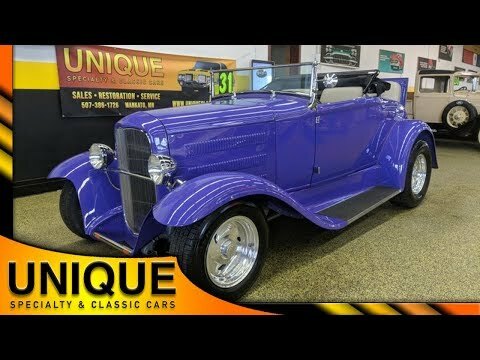 1931 Ford Model A Roadster Street Rod that is ALL STEEL! Hood, cowl, fenders, doors, running boards, and even the rumble seat are all steel! This Ford Roadster has a SBC V8 under the hood with Tri-Power paired with and automatic transmission. This car is equipped with front disc brakes as well as chrome drop spindles. The paint is in excellent shape and looks great on this car! The body lines are straight and you can just tell that this was made with time and money as this is such a quality build. This car comes equipped with working interior lights. The bench seat is a tan and does have reclining back. This car also comes equipped with some modern amenities including cruise control, tilt steering, and an aftermarket stereo with speakers wired throughout and even in the rumble seat area. Locar shifter on the floor as well as an emergency brake and upgraded pedals. The soft top is a retractable top. The rumble seat is furnished with the same tan upholstery. If you run into inclement weather, you can lift the top back up and slide in the included slide-in windows. This car has front and rear signal lights as well!